Did all the major companies' Canadian branches make civvy-lookalike MCP trucks during WWII? I have Canadian Chrysler and Ford sales charts but MCPs are not distinguished as such. 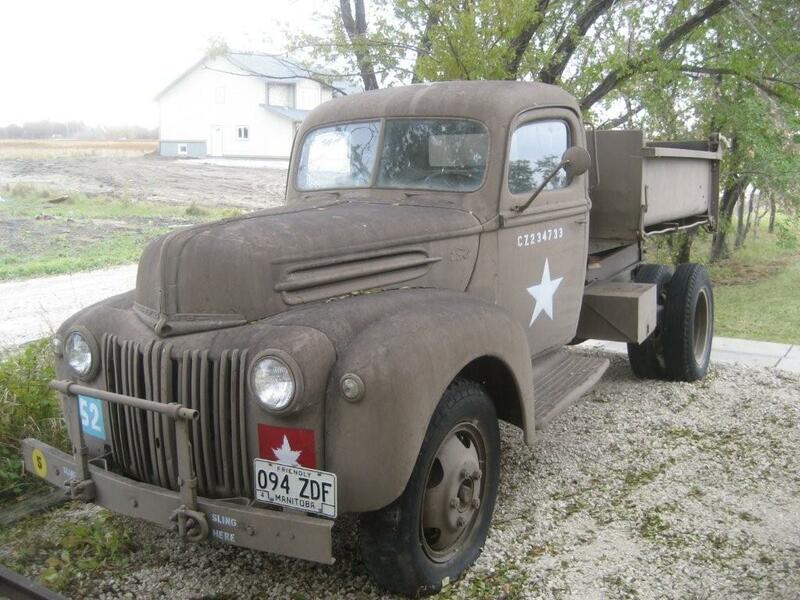 I know Dodge and Fargo trucks were made in this style, and I know from my charts that actual civilian versions of these were turned out in small numbers during the war. I suppose I should dig out my Vanderveen books when I get home (I'm at the office now). David's site shows the Chevrolets made. I'll need to check that out again as well. I guess my real question is, were there GMC and Ford MCPs? Here in the states, there was the Ford G8T, which was in production straight through the war, but looked like a 1942 Ford civilian truck. In addition, there were 3,500 civvy-type Ford light (1/2-ton) pickups made for the U.S. military between March 1942 and the end of the war (with 12,420 turned out during Feb.-Mar. 1942). Last edited by Bill Kreiner; 18-05-11 at 17:57. I have seen mostly Fords and some Dodge trucks as MCPs. They had a lighter version of the spring and bar push bumper on them, similar to the CMPs. They also had the Canadian style military marker lights on the fenders and the rear. I have not run across any Chev MCPs in my travels. They likely existed I suppose, but generally I find the chevs are not as much in demand with the commercial truck restorers. I guess my real question is, were there GMC and Ford MCPs? Here in the states, there was the Ford G8T, which was in production straight through the war, but looked like a 1942 Ford civilian truck. The short answer is yes, Ford did make MCP trucks, and they differed a great deal more from conventional trucks than their American enlisted cousins - see the quote from an earlier thread below. Chevrolet built a similar model, the CC60L. And here is a picture from Vanderveen showing the Canadian-built 1942 model Ford FC60L (or C298TFS), a 3 -ton 4x2 GS truck with 158in wheelbase and 95-hp V8 engine and a two-speed rear axle. It had typical MCP features like right-hand drive, 10.50-16 tyres on British split rims and a Canadian-built cargo body. There were military Canadian GMC trucks and the 1940/1 Model US GMCs were initially modified civilian pattern trucks. Thanks, everyone, for your helpful responses. Hanno, which book is that photo from? Is it from Historic Military Vehicles Directory, or one of the versions of Fighting Vehicles Directory? I have them all. Sadly, I don't have any issues of Wheels & Tracks (but I do have the four articles dealing with British "Tillies" -- Austin, Hillman, Standard, Morris). I didn't realize the Canadian Ford MCPs differ significantly from the American civilian-type military Fords. Offhand I can recall that the American-built G8T of late-1942-thru-early-1945 has headlight guards and no nameplate. Other than that I don't know. David, do you have the GMC MCPs listed on your site somewhere? A bit rougher than when it was built Bill, but here is a Chev MCP we are currently working on. Bill, I am sending you those copiues that you wanted. I have a list of ALL Chev/ML/GMC trucks on sale from 1939-45 from a parts list but you can't tell which ones were actually produced. I also have scanned photos of variopus military GM of Canada trucks, and they include from memory a GMC RCAF fire tender. I shal have to look it up sometime. There were I should add three? versions of the Chevy CC60L MCP which differed slightly...it gets very complicated! Tony -- Thanks for the pictures and the link to the other thread. That's a great find! I wish you luck with the restoration. I take it from reading the other thread that it's Holden-built and from 1941. David -- Thanks for sending the sheets. Hope the spreadsheet I made of the Ford of Canada data makes it much easier to read. That handwritten page is indeed a nightmare! As for the Chevrolets and GMCs listed in the parts book, do you mean not all of the models listed were built? I certainly agree that researching the MCPs is daunting and confusing. Well the US produced lots of military Dodges, plus some militarised civilian, and loads of civilian trucks were bought by the army. Canada produced military-specific types such as the T212 D8A, and militarised versions of standard trucks like the T222 D15 and T110L which were civilian in origin but had military bodies and fenders. In addition Canada produced loads of standard ( ish ) T116 one ton pickups and panels which were supplied to Commonwealth Forces, these were almost just civilian trucks painted green, but had additions like tow hooks and blackout light covers. Got one file image of a Dodge prototype 13 cab CMP, which I suppose would be a D15 but cabover CMP rather than the conventional cab. Tony -- I take it from reading the other thread that it's Holden-built and from 1941. Holden Assembled the imported chassis/cowl but built the cabs themselves in a similar manner to CMP imports at the time. In the early war years a number of GM car chassis were built as ute's (pickup trucks) by Holden as well including Pontiac's and you think researching the American and Canadian MCP's is hard. There is even MCP versions here that were modified to see if making them could save steel and make assembling them easier plus GMC CCKW352 airborne trucks modified and rebuilt by GMHolden for both the US and Australian forces during the war as well. here is 4 Aussie Chev MCP vehicles plus an "Indian bodied" Chev cowl unit in Tobruk. The "Indian Bodied" Ambulance from 119 Australian General Hospital 1942 is unusual in that it is built on a LWB Chassis and not the normal SWB one. Note also the different front mudguards (fenders) then the normal Civilian ones. The modified front end was actually one of two experimental conversions to establish a version to facilitate in-field repairs rather than save metal. From 1939, for the initial years of the war, all they had here were civilian based vehicles , mostly. The govt. impressed or stole many 39 and 40 model civvy trucks from their owners , who never saw the trucks again. I met an old guy who had his 39 or 40 model chev truck taken, he said he got no money for it. Dont know if that's true . That picture comes from Vanderveen's FVD WW II. As far as I can recall, Wheels & Tracks only has minimal information about MCP vehicles - click here to see a fairly complete listing of relevant W&T articles. Please bear in mind there is a difference between conventional and modified conventional pattern trucks, both of which were used by the military. I will piece some more info on this together later and post it here. I doubt if the differences between conventional, modified conventional, military pattern and one-offs show up in the sales charts, but it would be interesting to get some more detail. In THIS THREAD, Hanno Spoelstra showed these pics which show the difference between the Commercial Ford in Military trim (2G8T), and the Modified Commercial Pattern Ford (FC60L). Your second pic is a MCP cab on a C15A chassis, an interesting conversion indeed. There are contemporary photographs of 1940 4X4 Maple leaf MCP trucks , apparently assembled by GMH . There is one in the Vanderveen bible , 72 edition. A GM version of the M-H No.3A more or less . As far as I know, no survivors have been found . I have also seen pics of them in that GMH history book they published just after the war... so they definately did exist , but technical specs. are vague at this stage . Thanks very much, everyone, for your very helpful replies and photos. Local Chap: That other thread you kindly linked me to contains great photos. I'll need to study them more to learn the differences between the American G8T (is the 2G8T you refer to the same vehicle?) and the Canadian MCP Ford trucks. I'm friends with Ford expert Jim Wagner, but even he is not very familiar with the MCPs of Canada. I'm eager to learn more from you all. Mike: That postwar booklet of GMH's wartime activities is the same one you sent me a CD of years ago, right? I'll need to dig that out to view it again. I'm also going to dig out my Branham's books from the wartime and immediate postwar period. Only a few have Canadian sections. I know I have 1944, 1946, 1947, 1948, 1949, 1950 editions. By the way, today at a car show in New York State, I saw a 1944 Chevy pickup, delivered new to a farmer in August of that year (according to the present owner). I wish I'd taken my camera or camera-phone with me. Now I know some were built in 1944-1945 for essential civilian use, but I also know many 1942-built ones were stored (along with 1942-built passenger cars), to be doled out during the war to those who could prove a need. Many states titled them as new vehicles in the years in which they were sold. I wasn't able to see the serial plate to determine just what this one was. The 1944-1945 models are still coded with BK codes, like the 1942s, I believe; but I think month and year of manufacture are somehow encoded on the wartime-built ones. Standard, Conventional or Commercial: used in great numbers by military users. Military modifications ranged from none, to matt paint plus black-out lighting, to off-road tyres and military cargo bodies. Canadian forces at home used mainly US type commercial trucks. Modified Conventional Pattern (MCP): standard types with modifications to meet military requirements, comprising cars, utilities, 15-cwt, 2-ton and 3-ton trucks. Shipped out in large numbers, notably for use in the North African campaigns. Fitted with uprated chassis, springs, WD split rims (13, 16 and 20”), single rear tyres, RHD (for overseas use), military bumper and push bar, black out lighting system, WD towing hook, matt paint, etc. Over 300,000 MCP trucks were produced in Canada by Chrysler, Ford and General Motors. Local Pattern, later: Australian Pattern: referred to as such to distinguish them from overseas military pattern vehicles which were also used. Most Australian Pattern vehicles produced early in the war were militarised commercial types (4x2, 4x4, 6x6). All were adaptations or modifications of commercial-type vehicles, mostly of North American origin and assembled in Australia with locally produced cabs and bodywork. Many were fitted with oversize tyres (incl. 18”), single rear. This class also included tracked carriers, armoured cars, tanks and trailers. Department of National Defence (DND) Pattern, later: Canadian Military Pattern (CMP): a class of vehicles, devised and developed in Canada by Ford and GM, guided to a large extent by developments in Britain and fitting within British chassis (load) classifications. They combined British War Office design features (forward control, large single tyres, etc.) with American engineering (engines, transmissions, axles, etc.) and mass-production techniques. Thus main standard commercial components were used (engines, gearboxes), driven front axles patterned on the American Marmon-Herrington design, using standard type differentials. High degree of standardisation throughout the CMP range of vehicles. In Australia CMPs were officially known as CWO (Canadian War Office), but popularly known as “Blitz” trucks. To be updated later, meanwhile your input is appreciated. To complement and compliment my colleague's very well set out description, the DND (Department of National Defence) papers from 1940 refer to Modified Commercial Pattern. That was at the time when they also mentioned DND-pattern trucks (with the C30S/F30S). Known other Chevrolet MCP trucks include 1/2 ton 115" wheelbase Model 1311X3 for India (and alsdo some for the LRDG), 1421 1-ton chassis with flat-face cowl 125" wheelbase, 1531 2-ton 134 1/2" wheelbase chassis with cab including 200 1533x2 for the LRDG. No 4x4s, but THIS THREAD discusses GMC/Maple Leaf/Chev trucks in the Civvy and Military versions. Good you mention this. It strengthens my idea that the Modified Conventional Pattern class were Canadian-built vehicles primarily built to meet British War Office specifications after the Fall of France had decimated their vehicle inventory. The line between the first and second category is difficult to draw. Vanderveen lists 388,299 4x2 Commercial and Modified Conventional vehicles were produced in Canada, of which more than half were 3-ton 4x2 Modified Conventional. That other thread you kindly linked me to contains great photos. I'll need to study them more to learn the differences between the American G8T (is the 2G8T you refer to the same vehicle?) and the Canadian MCP Ford trucks. I'm friends with Ford expert Jim Wagner, but even he is not very familiar with the MCPs of Canada. I'm eager to learn more from you all. Ford Canada produced both the Commercial and Modified Conventional Pattern. the differences between the American G8T (is the 2G8T you refer to the same vehicle?) and the Canadian MCP Ford trucks. as decribed by Data Book of Wheeled Vehicles: Army Transport 1939-1945, the US-built Ford 3 ton 4x2 with 6-cyl. engine and 158" wb chassis must have had the Ford US model code G8T for 1941 models and 2G8T for 1942 (and onwards) models. Then there is one which has more military specs: beside the features of the first one, this one has beefier six-stud wheels, petrol tank on the outside of the chassis and black-out lighting. Do you fellows know more about the Australian "Local Pattern" ?? Anyone know of or have access to Australian army archival inventory lists, specifications etc?? It strengthens my idea that the Modified Conventional Pattern class were Canadian-built vehicles primarily built to meet British War Office specifications after the Fall of France had decimated their vehicle inventory. I see where you are coming from here and it is well thought-out but the evidence shows that this may not have been the case. The first reference to the British Purchasing Commission placing orders in Oshawa was around 22nd June 1940, so the Ministry of Supply must therefore have been intending to place orders for DND Pattern and Commercial Pattern trucks some weeks earlier and thus before the Fall of France. S/M 2005 totalled 4,787 Chevrolet 3-ton 1941 Model CC60L 4x2 trucks, split 3,150 for Egypt, 670 for Mombasa and 867 for England with 71 Stores, Wreckers and Machinery split 50 for Egyptt, 10 for Mombasa and 11 for England. Demand 2004 totalled 5,742 3-Ton Ford 3-ton 4x2 EC098TFS trucks plus 86 of each of Stores, Wreckers and Machinery. Tony, an interesting query! I don't know the answer myself about Local Pattern but there may be some information in the Ford and GM books by Norm Darwin published by Eddie Ford. I would be interested to know more myself.